Why hello! As I mentioned on Facebook and in this post the other day, this week is Australia Week on Southern In-Law, as it's Australia Day this coming Sunday. Throughout the week, I'll be sharing a bunch of healthier Australian Recipes - from classic recipes to recipes that have a bit of a SIL twist! 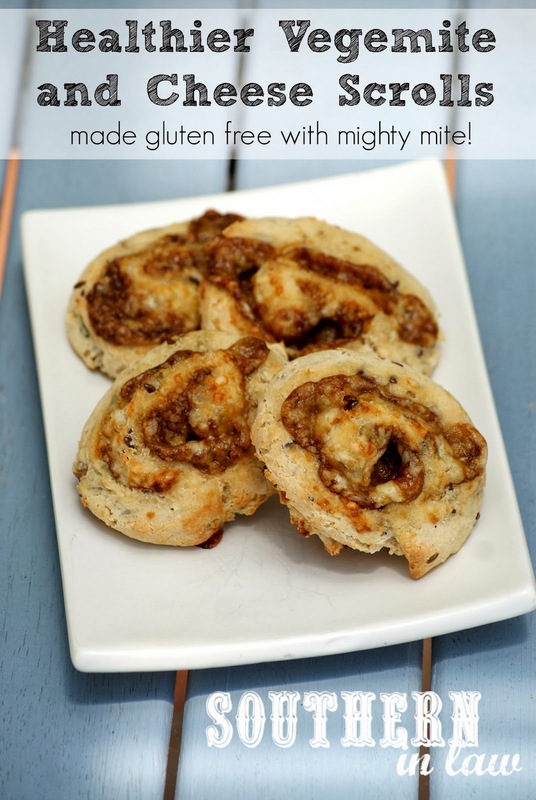 I wanted to start off with one of our new favourite recipes, Healthy Cheesymite Scrolls! You see, if I were ever to win Australian of the Year, it'd probably be because of one incredible act of Australianism (yeah, I made that up). What's that act, you ask? I got my American husband to fall in love with Vegemite. Some people say it's impossible for non-Australians to love Vegemite, but Jesse proves them wrong. 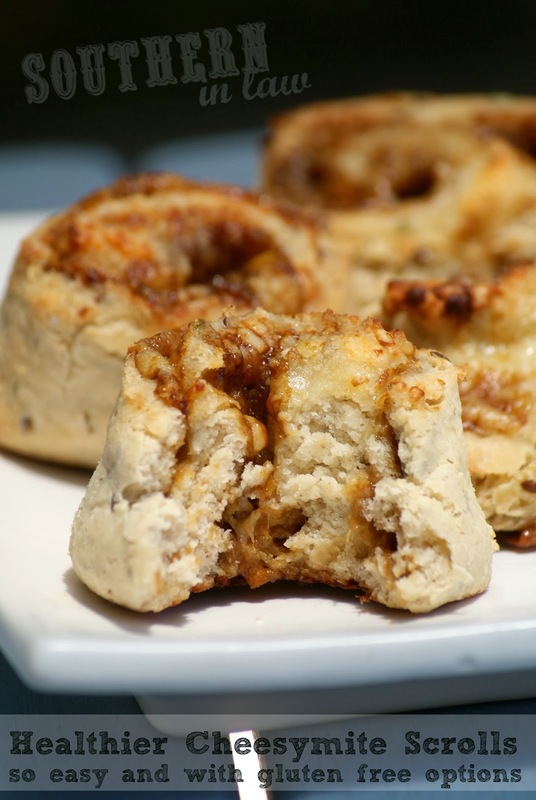 I have an American husband who craves Vegemite, who asks for Vegemite Sandwiches on most days, who practically married me all over again when I made these Healthier Cheesymite Scrolls. I've always been a Vegemite loving girl - but when I found out I was a coeliac, I also found out that one of my favourite foods contained gluten. Vegemite is not gluten free - but don't worry! There are replacements! My favourite gluten free vegemite alternative has to be Mighty Mite. Actually, I've found myself loving it even more than vegemite as it's easier to spread! 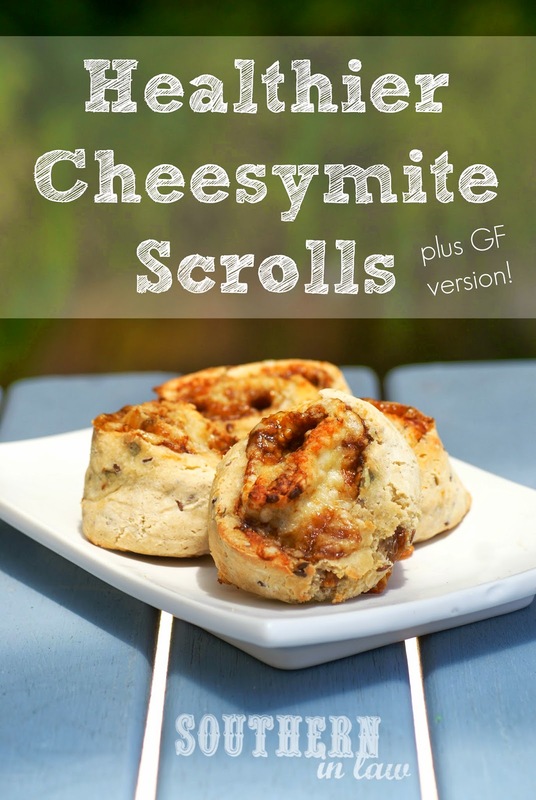 When I came up with the idea of making healthy vegemite and cheese scrolls, I knew that I also wanted to make gluten free vegemite and cheese scrolls - so naturally, mighty mite had to come to the party. And ohhhhhhhhhhhhhhhh what a party this is. Usually, I avoid bread doughs (or any kind of doughs) like the plague. I hate rolling dough out, resting, waiting, squishing, dough sticking to your hands and your arms and your clothes and a big sticky icky mess. Eugh. Muffins, pancakes, crepes and cakes are so much easier, mix, pour, bake. But this Healthy Cheesymite Scroll Recipe is so simple - and I promise it's not just a big sticky mess. I didn't even have to flour my board when rolling out the dough! makes 8 scrolls that are gluten free, low fat, egg free and freezer friendly! In a bowl, mix together your choice of flour and the butter/spread with a fork until the mix resembles coarse bread crumbs. Don't worry too much about incorporating all of the butter as it will mix in later. Next, add your buttermilk, stirring until your dough begins to form. Cover your mixing bowl with cling wrap and refridgerate for around half an hour to chill the dough. Once your dough has chilled, place a piece of baking paper onto a large chopping board or clean bench top. Place your dough on top, and then place another sheet of baking paper on top. Roll your dough into a rectangle of even thickness, about 23cmx33cm/9"x13". Place your rolled dough onto a cookie sheet still on the baking paper. and place back into the fridge to chill for another 30 minutes. Get out your dough and place onto your board or clean bench top. Take off your top piece of baking paper and then place back onto the dough, flip the dough over and take off what was the bottom piece of baking paper (this just stops it sticking later). 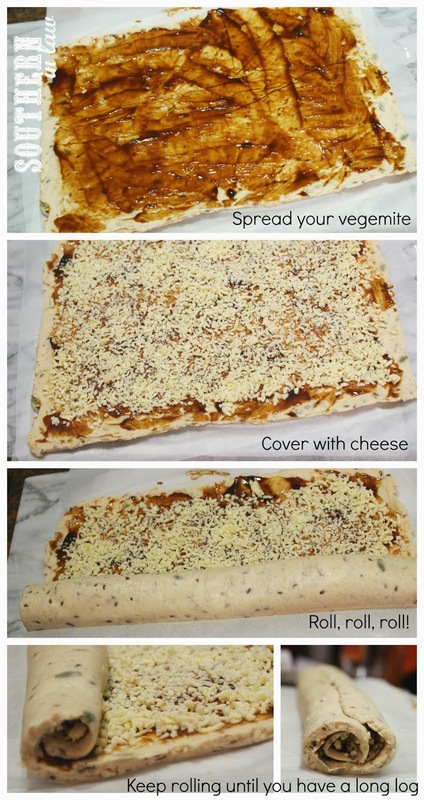 Spread your vegemite/mighty mite over the top of your dough, spreading to cover the entire surface area. Next, sprinkle your grated cheese right across the dough, spreading to cover the entire surface area. 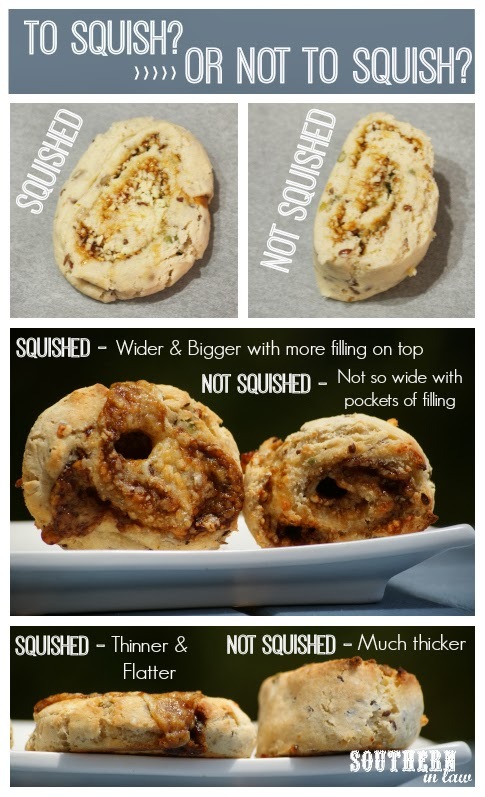 Now, use your baking paper to roll your dough into a long scroll (see pictures below). Once your dough is in a tight log/scroll shape, wrap it up in the baking paper and place it into the fridge to chill once more, this time only for 10-15 minutes. Get out your dough and slice into 8 pieces. See pictures below and decide if you want to squish out your pieces or keep them as is. Place your sliced pieces onto your prepared baking tray leaving room for the scrolls to spread. We placed 6 scrolls onto each baking tray. Bake for 10-15 minutes, or until your dough is cooked through and your cheese is bubbly and golden. To store: the scrolls will keep in an airtight container at room temperature for about 2 days (possibly longer but ours have only ever lasted 2 days before they disappeared, if that). You can also freeze them in zip lock bags for quick and easy lunches or snacks, just defrost them when you want to eat them! Gluten free version: 2 cups Orgran Gluten Free Bread Mix (our favourite is the Alternative Grain Wholemeal Bread Mix or the Quinoa and Chia Bread Mix which we used in the photographed batch) - you could also use any gluten free bread mix that you like. You don't need to chill the dough as much as we do in this recipe, but we found that it makes it easier and less messy to work with. By chilling the dough, we didn't have to cover ourselves, our chopping boards and our house with flour - so it was worth the wait. It also makes it super easy if you use the baking paper to help you roll up the dough into the scroll shape. Either way, they're delicious - it's just a matter of personal preference! But tell me, what was your favourite lunchbox treat as a kid? Kristy, wish I could get Mighty Mite in the US. I wanted to make GF cheesymite scrolls for Australia Day but knew that would kind of be tricky with Vegemite, which I can find. Thanks for introducing me to Mighty Mite. One day when I return to Australia I'll pick some up. Oh darn! We have lots of gluten free vegemite options here (mighty mite is just my favourite!) but I can imagine it's hard enough just to find vegemite in the US! My daughter has allergies- dairy being one of them. Do you think it would be possible to replace the buttermilk with rice milk? I'm okay with taste alteration, do you think it would alter the scroll much in the way it cooks? It should be fine but you may need to use a little less as the dough may be too wet (as rice milk is not as thick as buttermilk). It will affect the taste slightly but they should still taste delicious!